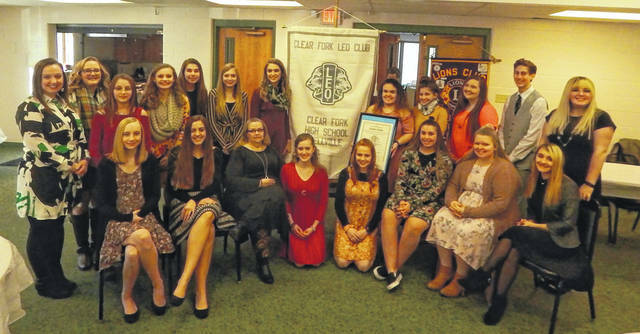 BELLVILLE — Clear Fork students are learning to lead, serve through membership in the Clear Fork High School Leo Club. The school-based service club that is part of Lions Club International for students. The Bellville Lions Club is the sponsor of the Clear Fork High School Leo Club, ;ed by Lions District 13 OH2 Gov.Keith Kauffman and Bellville Lions Club president Andy Brook. The Club advisors are Lion Donna Schreoder and Lion Nikki Traxler. The Leo club motto is Leadership, Experience,Opportunity. Members acquire skills as project organizers and motivators of their peers. LEOs will discover how teamwork and cooperation can bring about changes in community and their school. LEOs also will develop positive character traits and receive recognition for their service in their community. The Clear Fork club is planning a fundraiser to raise money for childhood cancer and in December they baked cookies for the patients at Country Meadows Care Center. An integral part of the Lions family, Leos also have their own global network of more than 6,500 Leo clubs in more than 140 nations. This international scope fosters a unique global identity among Leos and Lions.